As most companies are discovering the new GDPR requirements are both confusing and self-regulated. As a business, you have to heavily rely on recommendations due to the lack of definitive specifications as to what exactly is required and how it should be executed. As businesses provide their own self-assessment and statement that they comply with GDPR, clients are left not really being sure if their supplier actually abides by the new regulations. 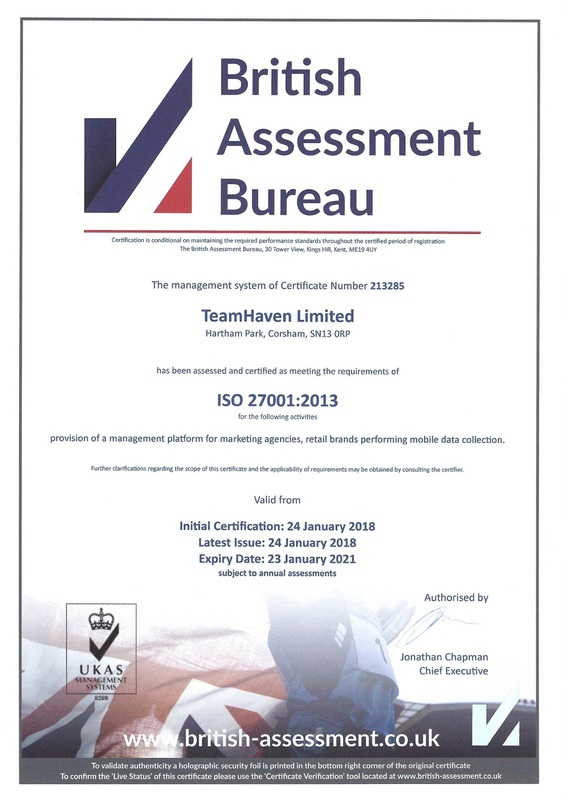 With this and the importance of data security in mind, TeamHaven has taken the proactive step to attain the ISO 27001 and ISO 9001 certification. By taking this approach, not only do you set data security standards that exceed the GDPR requirements, but you have these standards regulated by a third party. Steve Grimes CEO added, "Based on the fact that you can only refer to loose guidelines and that you are self-regulated, it seemed that the right thing to do would be to go a step further by applying for the ISO standards for Data Security." TeamHaven's clients can now have total assurance that the data security standards exceed the new regulations and provide total peace of mind. Deployed in over 60 countries worldwide, TeamHaven is a leader in providing a complete holistic solution for companies who deploy field force staff. With no setup fees and a low-cost usage fee, prospective clients receive a free customised trial in order to ensure that TeamHaven meets their requirements, all without any financial risk. Or contact one of our worldwide representatives on our website.